The classroom wing is in the background as men work on forms for the tilt-up concrete walls of Oak Grove Elementary School. At both construction sites, the process of building tilt-up concrete walls was under way. These slabs of reinforced concrete are being put together horizontally, three or four walls on top of each other like the layers of a cake. So why doesn’t the concrete for the new pour stick to the layer below? Because a non-stick agent is sprayed on the surface first. The explanation was provided by David McKay, managing director of HMK Company, the firm overseeing all the projects in the $187 million construction and renovation campaign of the Greater Albany Public Schools. It was McKay who conducted me around both sites. 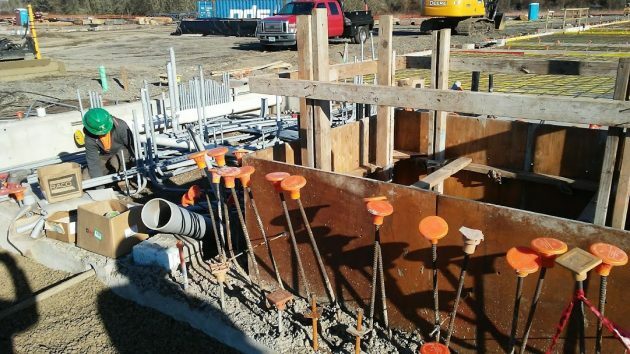 At Meadow Ridge, workers have installed an elaborate system of underground drain pipes, made necessary because the school is being built on wetlands. It was that extra element which put the project behind schedule, but they’re now catching up. The contractor also put down a foot or two of crushed rock to make sure work can continue through the winter. 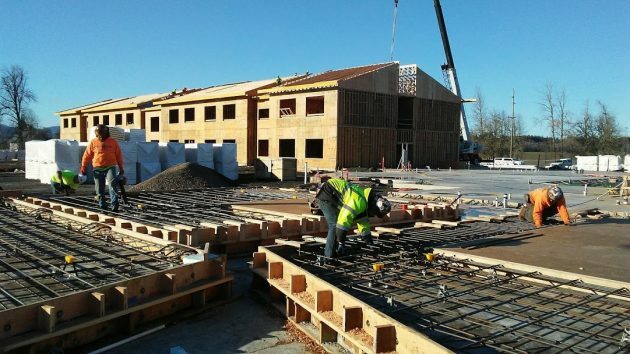 At Oak Grove, the framing contractor had prefabricated the wood-frame classroom section of the building, then set the pieces in place once the concrete slab was done. This approach made the classroom wing take shape in a matter of days. At Meadow Ridge, the builder is using a conventional approach to framing part of the structure. I wondered about wooden school buildings at this day and age. 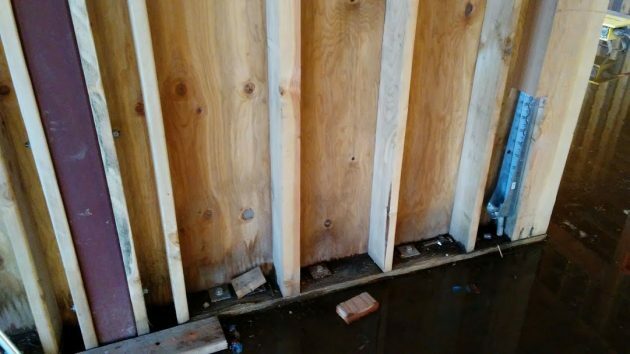 The exterior siding, I learned, will be of steel that won’t require maintenance for decades. Meadow Ridge, in northeast Albany, is being built by Todd Construction for about $40 million and is expected to be complete by the end of next year. At Oak Grove in North Albany, the smaller project at $27.5 million, the general contractor is Gerding Builders, and completion is expected late next summer. 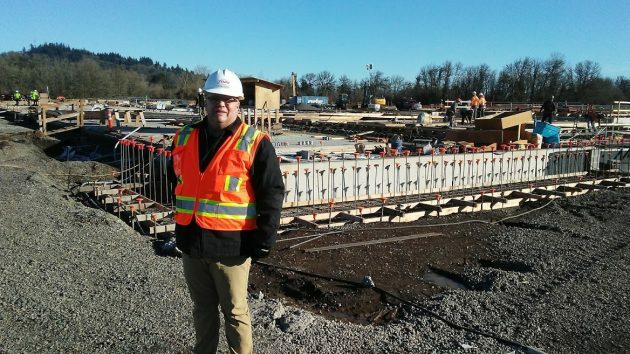 David McKay, managing director of HMK Company, at the Meadow Ridge construction site. The base of the elevator shaft at Meadow Ridge. Oregon lumber at Oak Grove School. 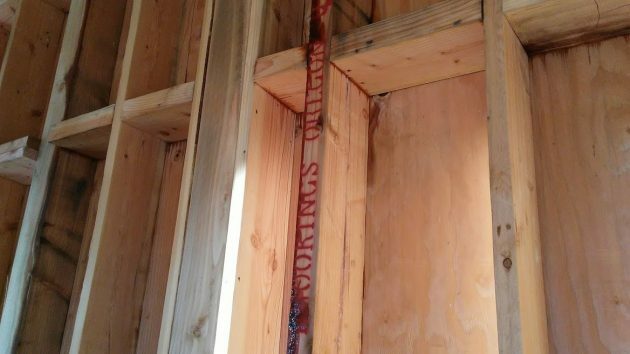 A steel post (left) and seismic anchor (right) in a wall at Oak Grove. Thank you for including the picture of Oregon wood. I also took a picture of the wrapping on the wood at Oak grove that included over five Oregon mills. Wood is an excellent choice for building. It is sustainable, renewable, beautiful (when not hidden by Sheetrock and siding) and comes from local forests. Wood also has the smallest carbon footprint of any mainstream building product. Our forest and wood products manufacturers in Oregon employ almost 70,000 people with family wage jobs, including me! The Shedd high school building which opened in 1949 was built with considerable community labor and tipped-up concrete exterior walls. It is currently owned and operated by Teen Challenge. We still store the farm-built, fir pole crane used to tip up the walls. Not noticing many changes in the current Albany school construction, I am wonder what will make these buildings more earth-quake stable than older construction designs? It must be ADA. And the handicapped should be the ONLY ones allowed to use it. Take a look at this time-lapse video showing the new Browns Point Elementary starting from the concrete floor slabs and a couple of gym walls. In reality, it takes a bit longer, of course. The school will open in late fall or early winter.